Lewis Hamilton sealed his fifth world championship with fourth place in the Mexican Grand Prix, capping a remarkable run of seven wins in eight races that blew Sebastian Vettel's title bid out of the water. 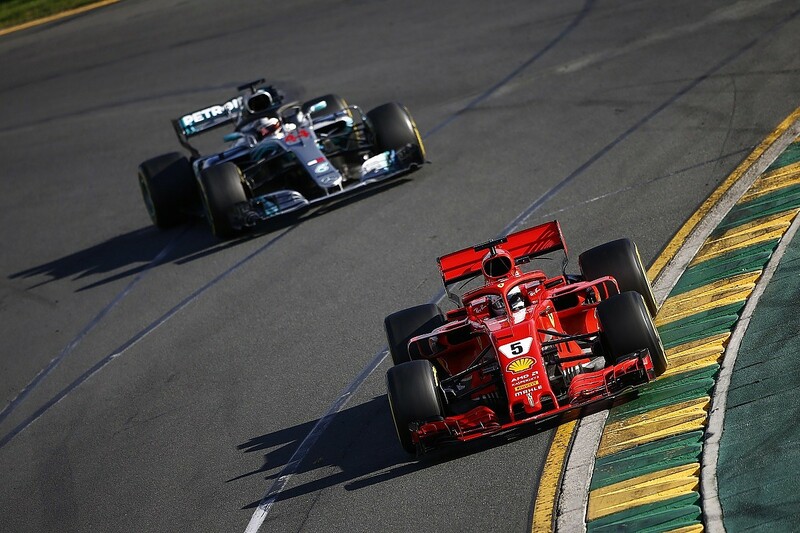 Winning the championship with two races to go seemed unlikely for much of the season, with Hamilton and Vettel exchanging the points lead several times before the mighty run of success began. These are the 10 moments that played a decisive part in the swings between Hamilton and Vettel that made this one of the most gripping championship battles in recent years - one that deserved a closer finish than Hamilton sealing the crown at Mexico City. Having taken pole position by over six tenths of a second, Hamilton seemingly had Australian Grand Prix victory sewn up. And he would have done, but for a combination of the intervention of the virtual safety car and a Mercedes miscalculation. Hamilton had made his single pitstop and was running second on the road behind Vettel. The Ferrari driver had been second-best of the Ferraris, but stayed out while team-mate Kimi Raikkonen pitted in case a safety car invention created an opportunity. That happened when Romain Grosjean parked his Haas after being sent out with a wheel not properly attached. "What just happened, guys?" asked Hamilton over the radio as he watched Vettel emerge from the pits just in front of him. This being Melbourne, Hamilton had no chance of repassing and Vettel took an early championship lead. It wasn't a software glitch, but a bug in the information used to calculate how close Hamilton needed to be to another car using an offline tool. The upshot was that he needed to be within just under 13 seconds in racing conditions, not the 15 the team believed, resulting in this shock turnaround. Had the mistake not happened, he could easily have closed the gap enough to Vettel and been able to retake the lead when the Ferrari pitted under the VSC. Vettel led the first stint of the Chinese Grand Prix, only for Valtteri Bottas to undercut his way into the lead at the first round of stops. Victory was still looking possible for Vettel as he piled on the pressure, before the safety car was deployed to clear up the consequences of the collision between Toro Rosso drivers Brendon Hartley and Pierre Gasly at the hairpin. Red Bull pairing Max Verstappen and Daniel Ricciardo both pitted for fresh rubber and began to charge through from fifth and sixth, with the latter on his way to victory. 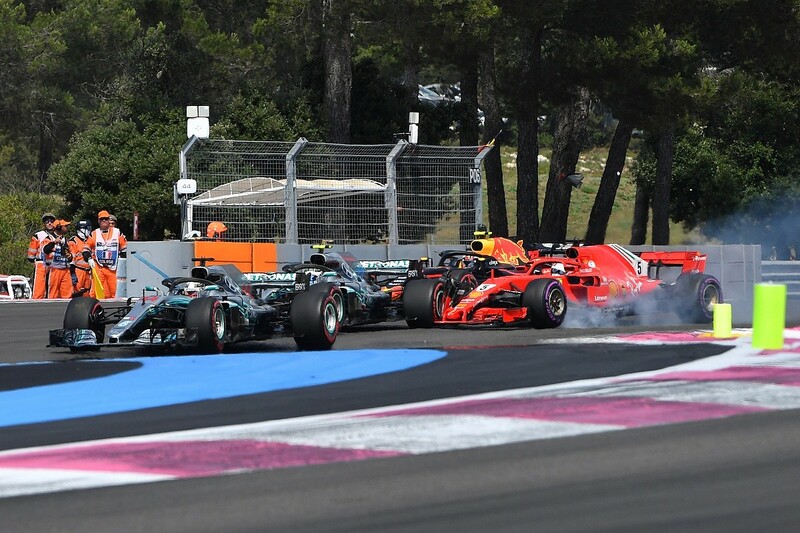 Verstappen had already been off the track while attempting to pass Hamilton when he bore down on third-placed Vettel on the run to the hairpin with 14 laps to go. The move was way too late and he clattered into Vettel, pitching the Ferrari into a spin. Vettel had slipped to eighth by the time he took the chequered flag after even being passed by McLaren driver Fernando Alonso, while Hamilton's subdued fourth place meant an eight-point swing towards him. Few drivers in the history of Formula 1 can have felt so downbeat after winning a grand prix, but following his triumph in Azerbaijan Hamilton was sincere in his claim that he didn't deserve to win. 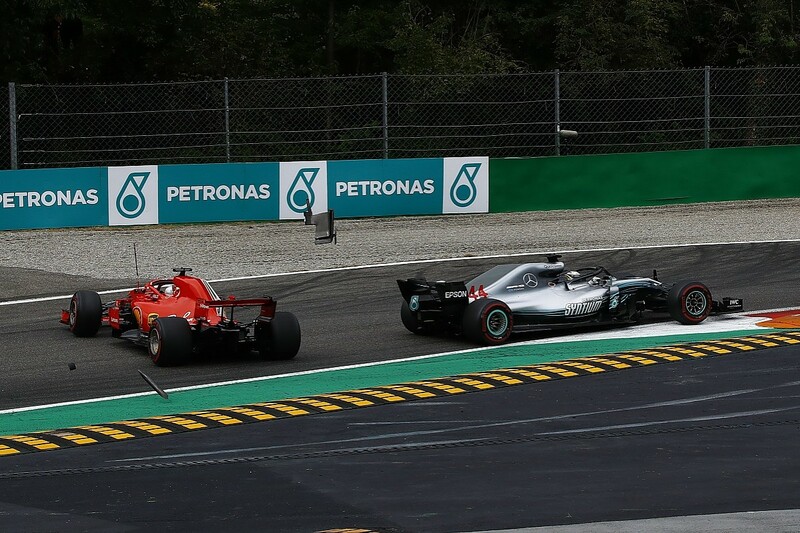 Having lost out on pole position to Vettel by 0.179s and then compromised his strategy with a big lock-up that forced him to pit early at the end of lap 22 of 51, Hamilton was running third at a safety car restart with just four laps to go. Vettel attempted to pass leader Bottas up the inside of the first corner and locked up on a bump. This meant he slipped behind Hamilton and, subsequently, both Raikkonen and Sergio Perez. At the start of the 49th lap, Bottas suffered a right-rear puncture after running over debris on the main straight, meaning Hamilton won and took the championship lead, with Vettel fourth on the day. A Mercedes power unit upgrade helped to swing the performance battle in its favour and Hamilton and Bottas locked out the front row on F1's return to France. Behind, Vettel started third and was using the ultrasoft tyres while both Mercedes were on supersofts. The start was his big chance, but having seemingly given best into the first corner he made a misjudgement, locked up and slid into Bottas. This dropped him to the back of the field, with a penalty, and he recovered to finish fifth meaning a 15-point swing in favour of Hamilton when Vettel would, all things being equal, have only lost 10 by finishing third. The Austrian Grand Prix was an object lesson in how things can fall apart, with Mercedes converting running first and second at the end of the first lap into a blank that handed Vettel the lead in the drivers' championship. Hamilton led from Bottas at the start with the added bonus that Vettel was down in eighth having been hit with a three-place grid penalty for impeding Carlos Sainz Jr during qualifying and then run wide at the first corner. Bottas was the first to fall while running a couple of seconds behind Hamilton 14 laps into the race. This was because of a hydraulic leak that started in the power steering and led to the system shutting down and eliminating the car's ability to change gear. He parked as far out of the way as he could, but after stopping at the end of the Turn 4 gravel trap the virtual safety car needed to be deployed to allow his car to be recovered. This led to Hamilton's race starting to unravel, as the team decided not to call the leader in for fresh rubber for fear that it would hand track position to Verstappen and Raikkonen. But instead, they were able to pit, losing less time than a normal green-flag pitstop, to then jump Hamilton when he stopped. Hamilton was later passed by Vettel in a great move involving taking a bit of the grass on the run to the hairpin, before grinding to a halt with a loss of fuel pressure. The one saving grace was that Vettel was only third behind Verstappen and Raikkonen thanks to his grid penalty. Vettel had victory in the German Grand Prix within his grasp when he entered Hockenheim's Motodrom on lap 52 of the 67-lap race. 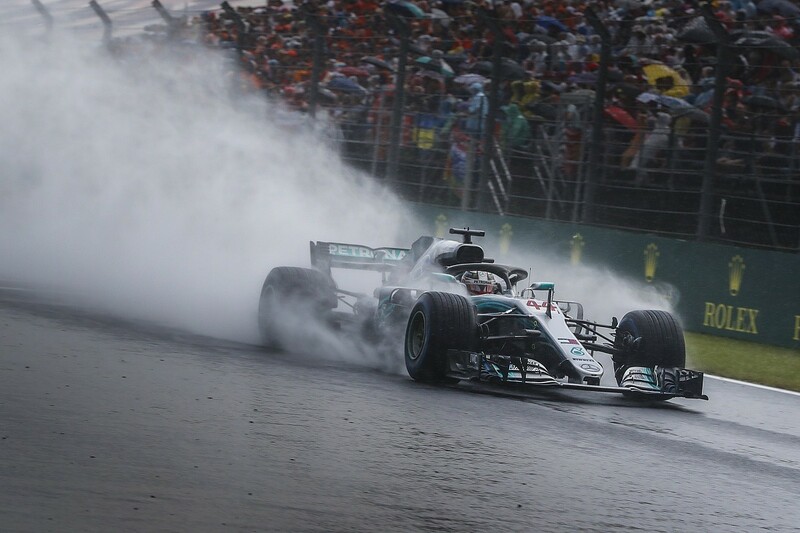 He had a lead of nine seconds over Bottas and Raikkonen, with Hamilton fourth, and seemed to be coping well with the rain even while on slicks. Then, disaster struck. 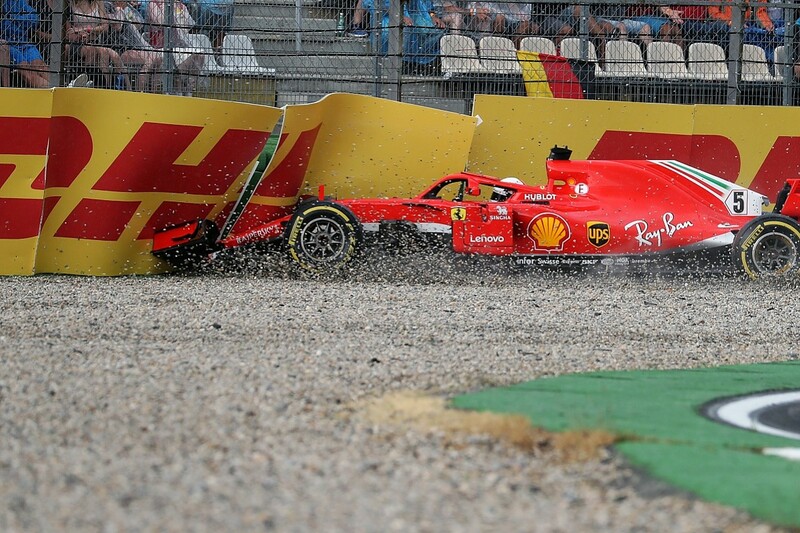 Vettel wasn't trying to push hard, he wasn't even aware of Hamilton setting a stunning pace behind, but he misjudged his braking into the Sachs Kurve. Desperately, he tried to get the front wheels unlocked while still slowing the car, but inevitably the gravel sucked him in. As Vettel struck the steering wheel repeatedly, he knew just how big the consequences of this small mistake were. He will have felt even worse as he watched Hamilton win the race from 14th on the grid, partly thanks to staying out under the ensuing safety car - after confused radio communication led to him rightly staying on track. That one mistake represented the biggest single points swing in the battle between the pair at any race in 2018. Vettel would surely have taken pole position and won the Hungarian Grand Prix given Ferrari had a small pace advantage over Mercedes. But then came the rain in qualifying, which allowed Hamilton to take pole position, gain the all-important track position and win the race. This was the second time in two races that rain had gone against Ferrari and for Mercedes, and although Bottas's race fell apart late on when he tyres dropped off and Vettel was able to finish second to minimise the damage, it meant Hamilton went into the summer break with the championship lead that Vettel, without his run of errors, should have held. Race day at Monza was the point at which the championship turned decisively in favour of Mercedes, as at the start of the race everyone was anticipating an easy Ferrari one-two. The trouble was that the Ferraris were in the wrong order, with Raikkonen on a rare pole position and Vettel behind. 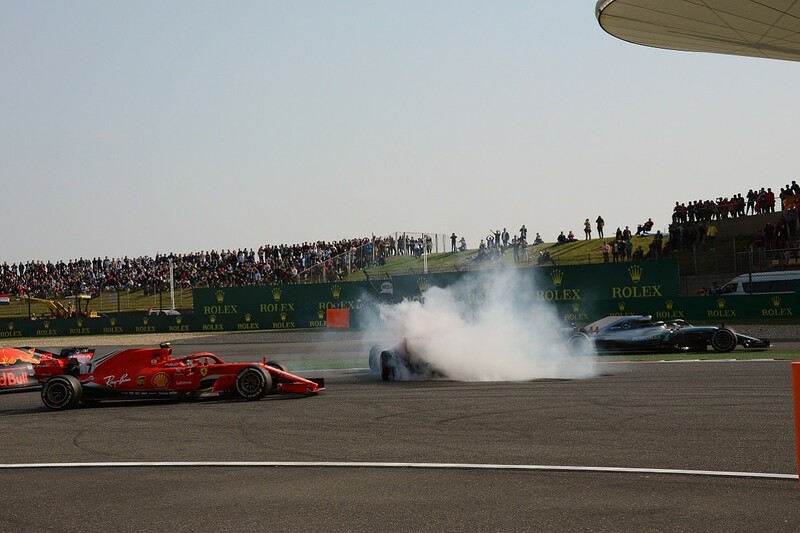 Vettel failed to get the jump on Raikkonen at the start, then while he was glancing to the inside of his team-mate on the run to the second chicane Hamilton got a run on the outside line. They went into the left/right flick side by side, but Vettel carried in too much speed and spun, dropping to the back. Hamilton survived. 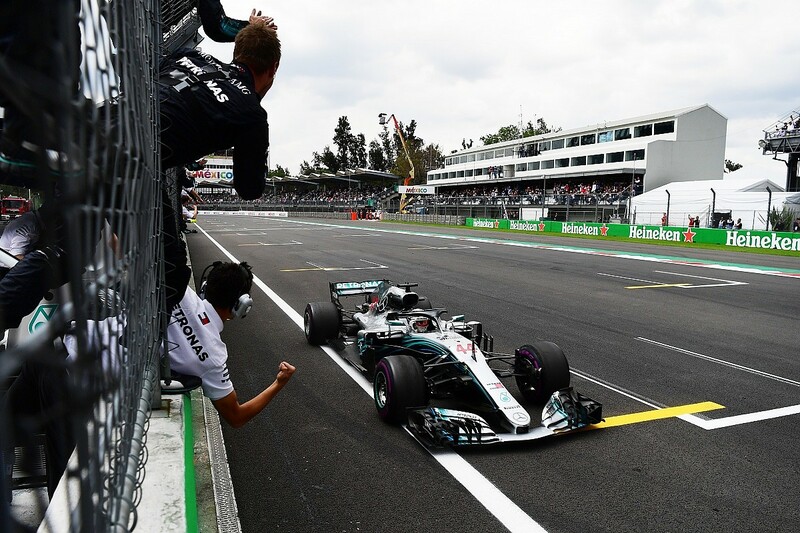 Hamilton then went on to pass Raikkonen, who was struggling with rear blisters after having to attack after his pitstop, to take arguably his best victory of the season. Vettel recovered to fourth, losing 13 points to Hamilton in the championship. Come the next race in Singapore, Mercedes had established a decisive pace advantage. 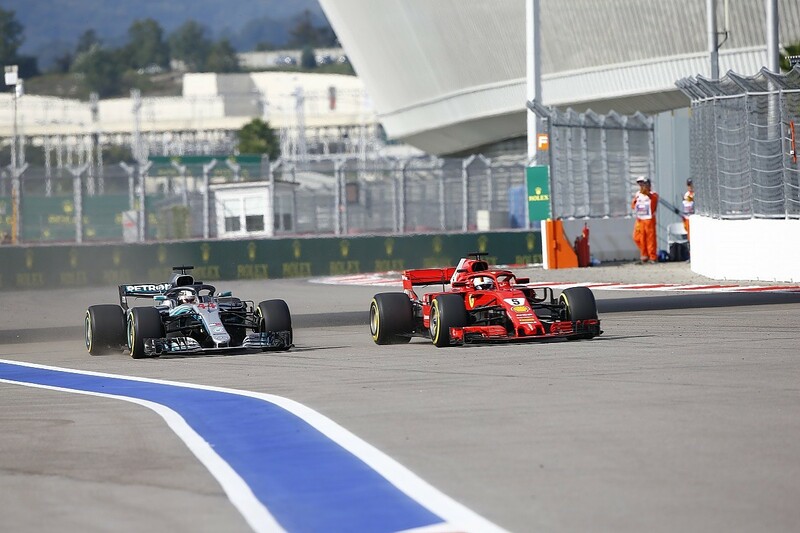 Vettel was presented with an unexpected opportunity to close the points gap on Hamilton at Sochi despite Mercedes having the upper hand on pace. And all thanks to another Mercedes strategic error. Sochi specialist Bottas led from Hamilton in the first stint, with Vettel chasing. But Mercedes allowed Vettel to undercut his way past Hamilton to run in de facto second place (Verstappen had a stint in the lead thanks to an alternate strategy from down the grid) by attempting to let Hamilton run for a lap longer than was ideal. This was because his tyres were holding up well, only to drop off late in the final sector and forcing him to take a costly extra lap. But Hamilton was in no mood to lie down, and once Vettel had used all his available battery power to defend on the main straight the world champion went around the outside of the Ferrari in the endless Turn 3 left-hander. 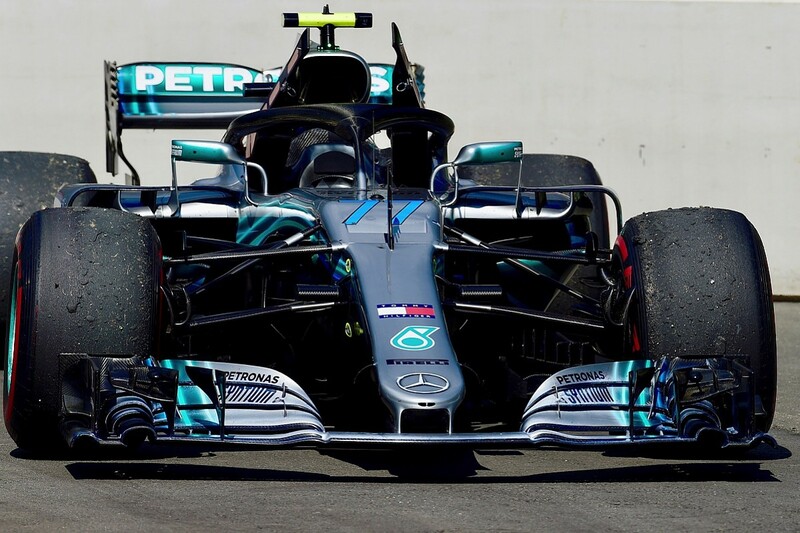 As a consequence of that attack, he suffered rear tyre blistering, leading to Mercedes ordering Bottas to let him past as a protective measure. The result was another 10-point swing in Hamilton's favour. Hamilton was expected to clinch the championship in the United States GP given he started from pole position. But things started to go wrong when Raikkonen used the advantage of ultrasoft rubber to jump ahead at the start. An aggressive early stop under the VSC committed Hamilton to a two-stopper, and when his tyres dropped off in the second stint he lost time to Raikkonen and Verstappen. After running long in the middle stint, he was playing catch up by despite a valiant effort late on could only finish third. The title would have to wait until Mexico. 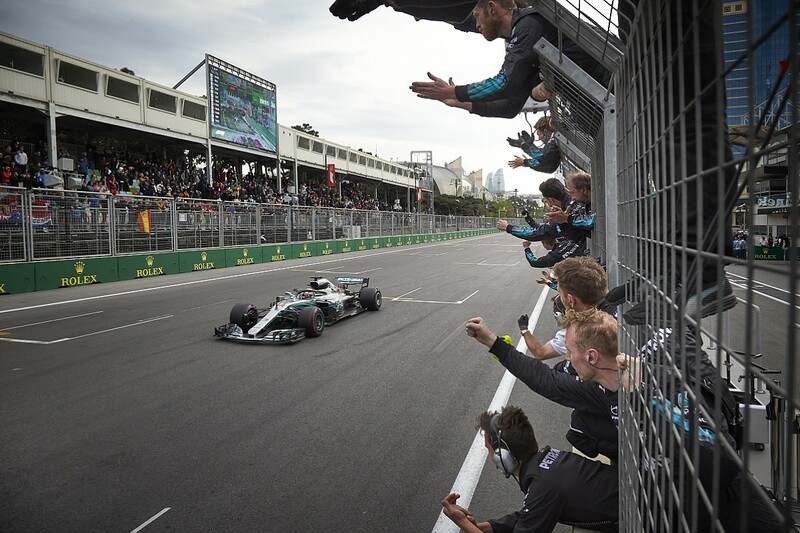 Despite a dismal race in terms of the Mercedes performance, fourth place after major tyre troubles was more than enough to give Hamilton his fifth world title.